I’ve failed as a food blogger! Apparently I have a real job that takes some time occasionally. And recently, it’s been all my time, and homemade food became a rarity. I started eating takeout or sandwiches for dinner, and not the tasty, interesting kind of sandwiches. The peanut butter kind. The closest I came to baking was making a half batch of chocolate chip cookie dough, sticking it in the fridge, and eating it raw over the next several days. Yes, I did that. But I’ve made it through the storm now and was drawn back to the kitchen by the lure of one of the most recent recipes to make the rounds on every food blog ever. 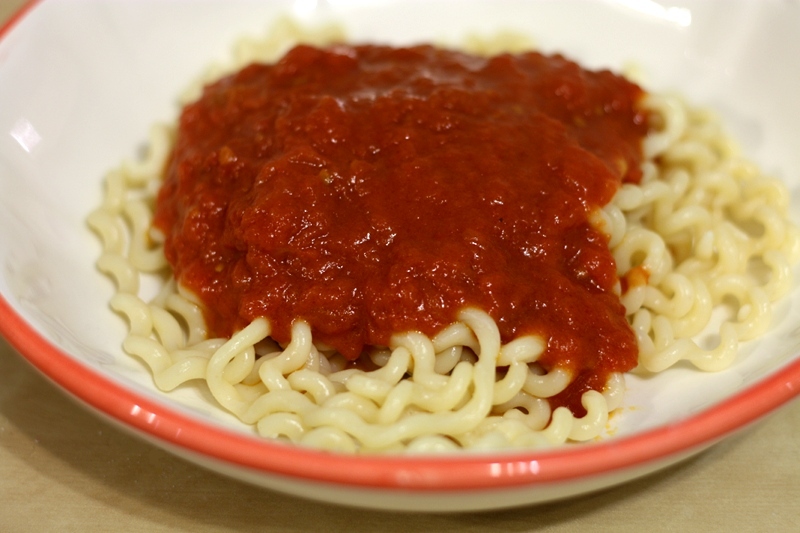 Everyone raves about this tomato sauce, and it has only THREE INGREDIENTS. Even I can do that! Although it did take me about a week to get around to it. I’ve been a little unimpressive lately. But once I did, I was really intrigued by the results. It’s so simple, but the tomato sauce is rich and velvety, and the butter makes it much gentler than the typical olive oil sauce. It’s really, really good. So here it is: the perfect dinner for when you’re crunched for time. It’s practically effortless, but it does need to simmer for 45 minutes so it’s still not totally ideal if you, like me, tend to come home at night wanting to eat that very second. But if you have some work to catch up on as it simmers and want a hassle-free meal, it’s perfect. Also, you will feel significantly less gross than you would after eating raw cookie dough for dinner – major bonus. 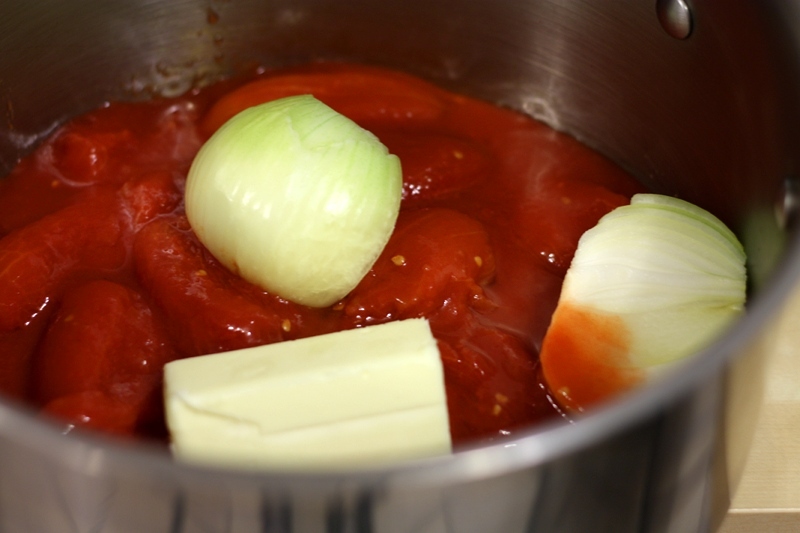 Put the tomatoes, onion and butter in a heavy saucepan over medium heat. Bring the sauce to a simmer then lower the heat to keep the sauce at a slow, steady simmer for about 45 minutes, or until droplets of fat float free of the tomatoes. Stir occasionally, crushing the tomatoes against the side of the pot with a wooden spoon. Remove from heat, discard the onion, add salt to taste (I used salted butter and didn’t need to add any), and serve over pasta. You are currently reading recovering tomato sauce at one cake two cake.